Capture the spirit of Christmas with this beautiful hand-crafted, gold-trimmed fabric Christmas Tree advent calendar which reflects classical Christmas nostalgia. 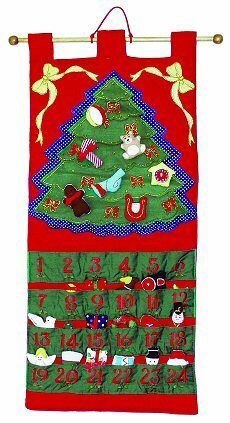 The 24 old-fashioned hand-sewn toy ornaments, nestled in their pockets, are placed (via Velco) on this Christmas Tree advent calendar one day at a time to count down the days until Christmas. Note: This cloth Christmas Tree advent calendar can be easily personalized at your local embroidery shop. This exquisite 'Twas the Night Before Christmas cloth advent calendar sets the scene for the traditional holiday story. This Santa's Workshop advent calendar features Santa in his sleigh getting ready to deliver Christmas around the world. This Oh Christmas Tree advent calendar brings added excitement to the Christmas countdown. Add a colorful splash of Christmas spirit to your outfit with this fun and festive Christmas Tree charm.